There are a very few magazines we came across which offers a quality reading material. Safari – a science and knowledge magazine is one of them. The latest issue (August 2014) is out and here are our views and reviews for the same. 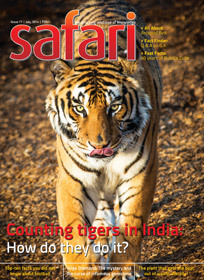 Carrying forward its tradition to have cover page giving us the impression of a wild life or nature oriented magazine, the August 2014 issue of Safari comes with dolphins (photograph/image, of course) on the cover. The inside cover page has a fascinating picture of a heritage site – Rani Ki Vav – in high resolution. Transportation is the key factor of articles in the “FYI” segment. An article about monorail is interesting. The article is written to show analytical study about the cost-benefit ratio of monorail and the transportation made through it. The article shows that as most of the countries are not much in favor of monorail, due to same. The article also shows how costly it is to create the infrastructure and run the services. In the same segment there is an article about rope-way. China can be considered as the country to found the first reference of rope-way. The article then discuss a little historical stuffs about rope-way and how it was initially opposed by the locales. The article gives brief summary of the rope-ways around various places in the world. A similar article about air traveling is also there. All these three articles are small yet good to read as it contains summarized information of its topic in interesting manner. There is an article about “pupfish” which is now considered as an endangered spices. Nature lovers will like to read this detailed artcile, others may not find it very appealing. The article about the brightest star is small yet interesting. The name of the star is R136a1 (quite like a number plate right!?). Though the article doesn’t limit its scope to this single star, it shows the comparison of several other bright stars with Sun, which makes it easy for the readers to compare facts. A very important article this issue brings is about “the missed call racket”. It is appealing to the majority of readers (we can say almost everyone). As all of us have experienced getting a “missed call” from an unknown number which often belongs to some other country. How we often respond to the number by calling it and how it can drain our pocket, is explained quite interestingly in the article. We strongly recommend to not to miss this article. It brings you information about a different kind of money-making schemes. We though feel that the article could have been more detailed and have some more real life incidents explored, which could have made it even more effective. We often don’t care about a lot of things and mostly the things related to nature are taken-for-granted by us. B M Purohit’s article about “top ten things about the the monsoon rain which are unknown to a lot of people” is an interesting read. These small points are very informative. We often hear interesting cases about how dolphins are reactive to the training. A number of amusement parks have various shows showing the “intelligent” aspect of the dolphins. Even the cases were in the print media exploring how dolphins helped various ships to reach to its destination safely in stormy and/or dangerous sea. It is considered as the second most intelligent animal (after man of course) in the nature. An article exploring the examples and thus firm the facts about the intelligent side of dolphins, is aided with images and illustrations and written in interesting manner. What is new or interesting to know about roller coasters than we know? If you think this, a two page “fast facts” segment about it, will definitely prove a worth read for you. India and Pakistan are not the only countries which are divided. There are many more who had seen the partition and its effects. There is an article “Divided Nations” in this issue, which is a consolidated and informative approach to the political changes around the world and its effects on the lives of normal people. 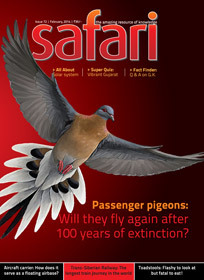 Bird lovers have an article about “pigeon racing” to please them in this issue. The last cover page contains an article about Jupiter. It is “All About” article and brings most of the information about the planet which is worth knowing. What type of milk is sold by the dairies? Is the milk always fresh, or could it be days older? Does the weight of computer hard disk increase as more and more data is stored in it? Why is coconut water considered good for health? What are its constituents? How much of the Sun’s energy is received by the Earth? How does the minesweeper ships of Indian Navy operate? How is it so that the cork, even though being a wood is so soft and light in the weight? How far can we see in the space? Is there any limit beyond which we cannot see even with the use of the most powerful telescope? What is the meaning of the declaration “made from concentrate” which is printed on some bottles/packs of orange juice? Do insects like the bee have a heart? What is its shape and size? How do parrots devour pungent chillies which pleasure? Do they have taste buds? Overall a balanced issue which is worth reading. There are a couple of articles which are must-to-read for almost everyone while others are found interesting for people interested in various hobbies or general knowledge. It is really good to develop a habit to read quality material and this issue is definitely a good resource to start it or continue it.